Of these, the speed at which you walk matters the least. The calories burned walking are primarily determined by your weight and how long you walk. That’s why beginners should first concentrate on increasing the distance they walk before trying to learn to walk at higher speed. A person who weighs 180 pounds will burn off 100 calories per mile walked. A 120 pound person, on the other hand, will only burn 65 calories by walking a mile at the same speed. This is because your body consumes more energy in moving a heavier body than a lighter one. Calories burned walking at high speed are slightly higher. When you walk at 4.6 miles per hour or faster, you’ll burn off 4.78 calories per minute of exercise. This is because high speed walking involves the use of more muscles, since it requires arm movements with a race-walking stride. Running, however, is much more effective in burning off fat. Every minute of running gets rid of 11.25 calories. As you run, your body moves up and down as well as forwards. On an ‘exercise per minute’ basis, running burns almost twice as many calories as walking briskly. Calculated over the distance of a mile, running uses up 26% more calories than walking. Another important contributing factor to the higher calories burned walking is “after burn”. This is the residual effect of intense exercise which lasts for a few minutes after you stop walking or running, until your basal metabolic rate returns to normal. After burning contributes to calories burned walking even after you stop. An important thing to keep in mind is that all these calculations are only approximations. They are all based on the premise that you walk briskly, managing a mile in 18:30 minutes or less. Why do calories burned walking matter so much? If you’re walking for weight loss or to get rid of body fat, then you must know how many calories are burned walking or running in order to schedule your exercising. A good starting point is to exercise long enough to burn off 300 to 400 calories every day. Reducing the number of calories you eat can be very effective in losing weight and getting rid of fat. Exercise and physical activity, on the other hand, works better to keep the pounds off and prevent weight gain. As your body gets accustomed to walking, your metabolism changes significantly and this means that your calorie intake and/or the calories burned walking must increase even more in order for you to continue achieving weight loss. How much exercise is needed to optimize calories burned walking? Most experts at physical activity for weight management recommend moderate aerobic activity for 150 minutes every week, or 75 minutes of vigorous aerobics. Moderate activity includes brisk walking, swimming and mowing the lawn. Vigorous aerobic exercises are running and aerobic dancing. To exercise for weight loss, you’ll have to work harder – and average 300 minutes of moderate exercise weekly. Make sure that each exercise session lasts at least 10 minutes, and that you spread out your activity and exercise over the entire week. You should also combine strength training with aerobics. Using weight machines, rock climbing or heavy gardening twice every week can build up muscle and increase calories burned walking. What’s most important is to find activities that you will continue to maintain over the long run. The activities should be woven into your daily routine, while being intense enough to raise your heart rate and burn calories. 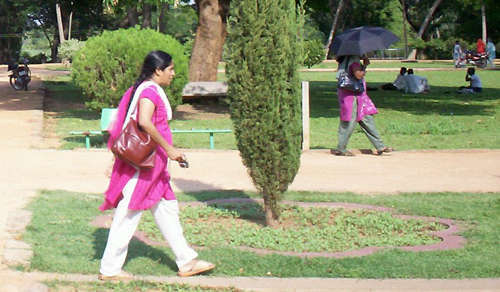 Brisk walking is an extremely effective and easy to follow method to burn calories and reduce weight. This entry was posted in Lifestyle and tagged calories burned walking, walking on December 27, 2013 by Healthy Living Guide.